Primary clay (residues) is a type of clay that is produced from the weathering of rocks feldspatik by endogenous force that does not move from the parent rock (rock origin) .Because this clay does not move then it is more pure than the clay sekunder.Selain hydropower , hot steam coming out of the earth also have contributed to the formation of primary clay. Because not washed water and not mixed with organic matter such as humus, twigs, or leaves rot and so on, then the clay tends to white or dull white. Temperature mature when burned ranged from 1300oC-1400oC, even reaching 1750oC. Which includes primary clay, among others: kaolin, bentonite, feldspatik, quartz, and dolomite. The position of these minerals usually found in places higher than the location of the secondary clay. In general, hard rock basalt and andesite will produce red clay while the granite will give white clay. Mineral quartz and alumina can be classified as a type of primary clay because it is a byproduct of the weathering of rocks feldspatik which produces clay kaolinite. 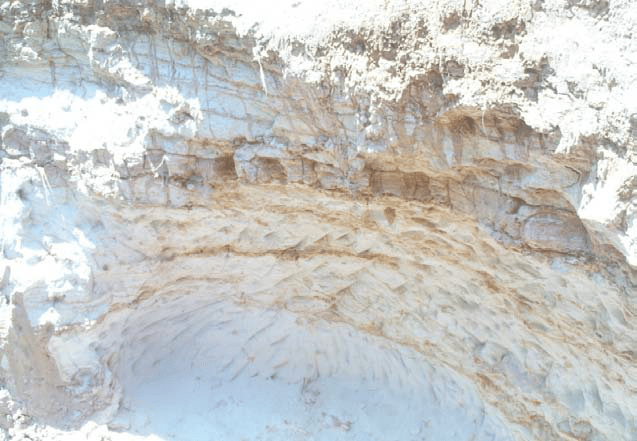 In the dry state, primary clay is very fragile, so easily crushed into this tepung.Hal caused the particles are formed is not symmetrical and bersudutsudut. 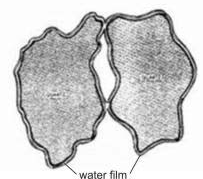 This structure is different on clay particles form secondary sejajar.Secara plates can simply be explained by the cross-sectional image slices quartz particles that have been raised several thousand kali.Dalam picture below looks both particles coated with a layer of water (water film), but because the shape is not Flat / asymmetrical, the water layer is not contiguous, consequently particles are not mutually sliding.